In Italy Tours is owned and created by Tania Pascuzzi. 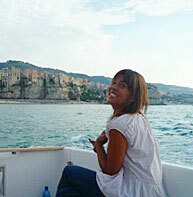 Born in Australia to Italian parents, Tania now runs culinary and sailing tours in Calabria, Lazio-(Castelli Romani) and Sicily. It was my passion for good food, good wine and good company that led me from a fashion career in New York City all the way to the beautiful coastal town of Tropea where I currently reside. Theres nothing I love more than to share my passion for authentic cuisine and culture with you as my guests by finding and creating bona fide, authentic experiences in Italys southern region of Calabria that you wont find anywhere else and you certainly wont forget. I was born and raised in Australia to Calabrian parents. My father, a winemaker, and my mother, a traditional Italian cook, taught me a lot about time-honored recipes and good wine from early on. I began vacationing on Calabrias coast, meeting wonderful local people and gathering knowledge of the varying culture and cuisine in each of the regions villages each time I visited. Each time, my passion and insight grew until I knew that my calling was here  to share the Italy that most tourists never experience. I decided to base myself in Tropea, Calabria because of its beauty, the exquisite beaches and the friendly locals. No one here had heard of teaching cooking to foreigners, and I was able to tap into a wonderful opportunity to offer guests intimate cooking lessons with locals who wanted to join in my passion for sharing their love for the region. From the high mountains near Sila to the coast of Tropea to the Castelli Romani near Rome, my aim is to bring that once upon a time in Italy feeling to every tour I create. Through my personal experience, I have had the opportunity to visit towns and places in Italy untouched by the influx of tourism. The real Italy. And its that authenticity that I try to convey in every cooking lesson and every tour. and leave feeling like part of the family. Tania Pascuzzi, Carolee Salat, Agnese Sanvito, Antonello Tropea, Lisa Chapman and Tracy Baker.